JESLED was occupied in LED lighting since 2009, including indoor and outdoor led lighting. The objective of JESLED is to offer superior quality LED lights to our clients, and enjoy a bright and comfortable life. Welcome to search 'JESLED' on Amazon to find more LED products. 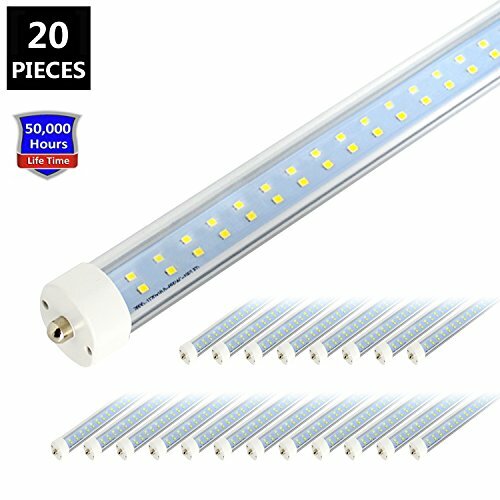 20-pack 50w 5000K 8ft led tube lights with clear cover. Order will be shipped from China within 2 -3 days, and it will be delivered within 15 days. ENERGY SAVING - Save 62% on your electricity bill! Replace 130W fluorescent tubes with 50W LED Tubes. NO STARTER AND BALLAST - Remove or bypass the ballasts (both electrical and Magnetic) is required, and remove the starter. NO DELAY, NO FLASHING - Our 50W Dual Row LED Light Tube is engineered to light instantly when the switch is flipped. No more waiting for old fluorescent tubes to "warm up" or turn all the way on! No Flashing light, benefit for our eyes! UNIQUE DESIGN - Dual Row LED Design,384pcs LED Chips, bring double brightness, Illuminate the darker corners of your space! HASSLE-FREE WARRANTY - JESLED offers 3-year unlimited warranty means we've got you covered! Contact us for an easy and fast replacement. If you have any questions about this product by JESLED, contact us by completing and submitting the form below. If you are looking for a specif part number, please include it with your message.